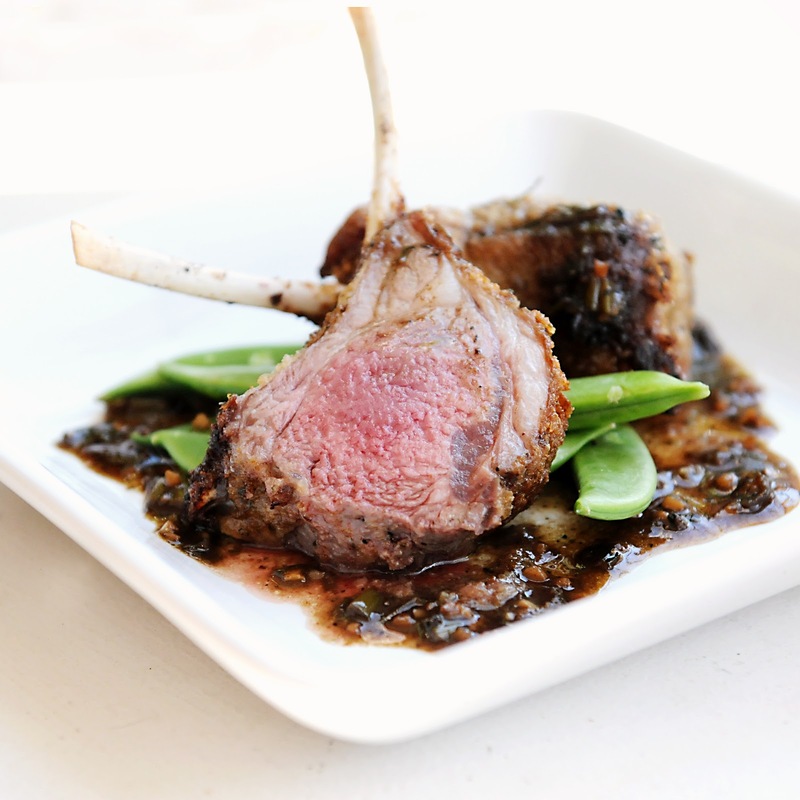 I have a list of things that I have never made because, in my mind, they have an aurora around them that denotes "chef's only"…Rack of Lamb is on this list. I have made leg of lamb without hesitation and it always turns out well. So what was the hang up for me with a rack? I honestly don't know other than I think that they look so dainty and delicate. I did not want to ruin them in the cooking process and have a failure on my resume. I am laughing out loud at that thought. I have a long list of things that have been made through the years that have not turned out "to my standard". This year is about "action" for me. I want to be more of a doer than I have been in the past. In order to accomplish this goal I will be forced to tackle and try new things. Mind over matter. My mind tells me sometimes that I can't, but no matter what, I need to push through the doubt, fear and task. Go for the gold! I purchased this lamb on a whim and took it home. We had a few stare downs as I pondered what I was going to do with it. I studied a few pages, cookbooks and such to find the best method for cooking this dainty rack. It seemed much easier than I thought it would. The main concern is over cooking it. Lamb should be enjoyed medium rare or medium. I knew this would be a concern for my son. He does not like rare meat of any kind. 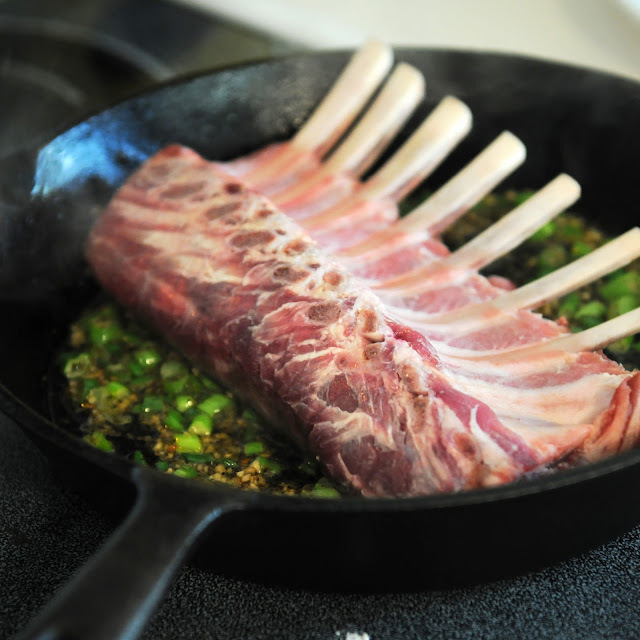 It turned out to not be a problem because once the lamb was done and I was able to cut the rack into baby chops, I found the outer chops to be medium and the center was rare….the best of both worlds. I will definitely make this again. The texture is so buttery that the meat actually melts in your mouth. 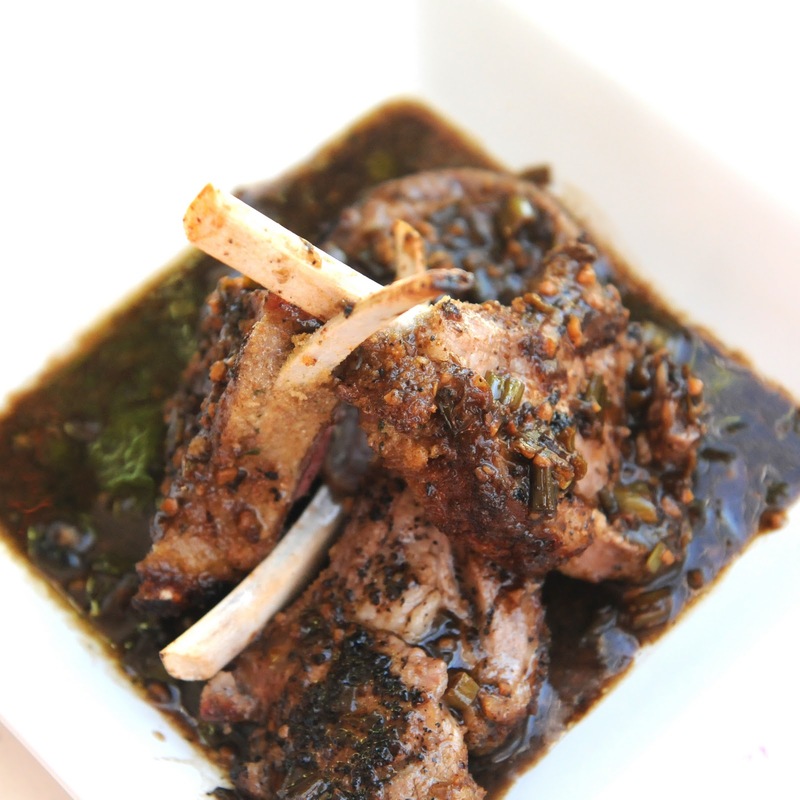 I like to have lamb with a mint jelly. Last night I did not have any around and decided to make a reduction with what I had left over from searing the meat…it was perfect (another first for me). ACTION. I am doing instead of talking about it. RESOLUTION: Actions speak louder than words. I must become more in tune with my ability to do and not just talk about the things I want to learn. I must take the first step to success, which I have learned is sometimes the hardest…baby steps are still steps. In the kitchen I still have a few things to tackle on my "bucket list". You're never to old to learn and I am hoping this year it will be filled with new skills, recipes and action. I preheated a separate cast iron skillet while I was searing the lamb on the stovetop. In a cast iron pan, I added the olive oil, onion, garlic, salt and pepper. Once the oil was hot enough, I seared the lamb on both sides for 4 minutes. I put the bread crumbs in a shallow dish and rolled the rack in the crumbs to make sure that all sides were covered with a thick layer of the breadcrumbs. I transfered the lamb to the second skillet that was preheating in the oven. I laid the lamb with the ribs down into the pan. I inserted a meat thermometer. I set the timer for 15 minutes. 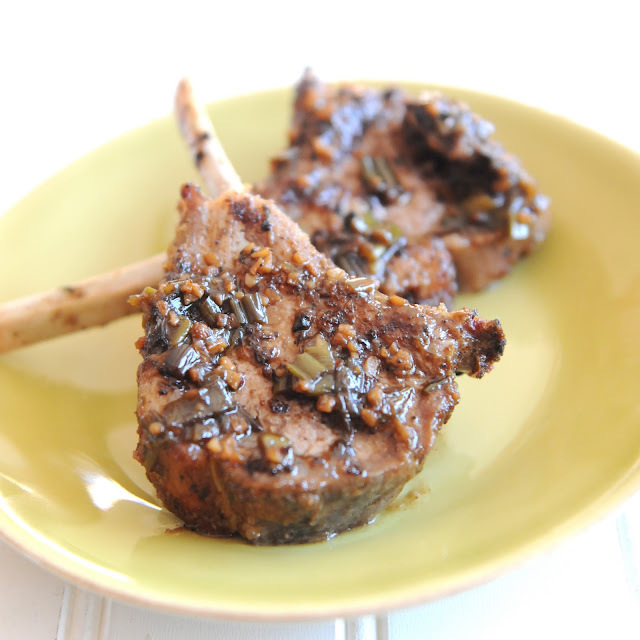 A rack of lamb can cook very fast and it will continue to cook after it is removed from the oven. I removed the lamb when the temperature read 125, some people like it much rarer than this and will remove the lamb at 115. This allowed for the outer edges to be medium and the center to be rare. I let it sit for about 10 minutes and then sliced them into individual cuts. If the meat on the very center is too rare still, you can sear them quickly in the cast iron pan that you used to cook them in. You don't want to over cook the meat so take your time. While the lamb was cooking, I added the wine and balsamic vinegar to the cast iron pan on the stove top. I set the temperature to medium high and stirred constantly until the ingredients were a rich, dark color. This provided me with about 2/3 of a cup of reduced liquid. I drizzled this on the plate that the lamb was served on and a bit on top. It was just enough to add some flavor but not take away the lamb flavor. I also added the rest to a small bowl and served on the table in case more was wanted by my family. Sherron, these look perfect, moist, juicy, delicious! I think you have conquered the rack of lamb! Can you please adopt me ;) ? Katie..LOL sure, the more the merrier! I adore lamb...yours looks cooked to perfection! The first photo is absolutely stunning! I didn't grow up eating lamb (it's not very common choice of meat in Japan), but this definitely look VERY appetizing. My husband always misses eating lamb. I need to copy this recipe and send it to him. =) He might cook this for himself (and us...hehee). Thank you Amy…I am a little late in getting responses back to folks. I had a shoulder injury. Have a fabulous night!